The Jeffco Invitational Giveaway officially began in 1998, but it's roots go back several years before that. Back in 1993, when Jeff was coming out of University and moving on from there, he had lots of extra stuff which he was just storing and holding onto for no reason. Things like posters and lamps and frames. Rather than hold onto them forever, he would take them over to friends houses and give them out to whoever wanted them. Being that Jeff often bought things on a whim or got gag gifts that were funny one moment then not the next, this led to more stuff being gathered and more and more informal giveaways happened. It was in 1998 when the process got an actual name and became the reason for inviting people rather than just having it happen. This first giveaway was held in Jeff's apartment and had basically no notice or fanfare. Originally, there was no money. Jeff held up an item and whoever said they wanted it first got to keep it. While this had worked in the past, people began to outsmart the system and take everything then leave it once the auction was over. This defeated the purpose, so the following year, play money was added to make people have to actually bid on items to get to keep them. It was at this point that the charitable element was added, making people bring toys for Toy Mountain to get money to bid with. For the first couple of years, all of the items to give away were from Jeff or from Dave, and slowly, the addition of allowing people to donate items was added. Focus has shifted over the years from gathering toys for charity to be more focussed on recycling worthy items, although toys are still collected. 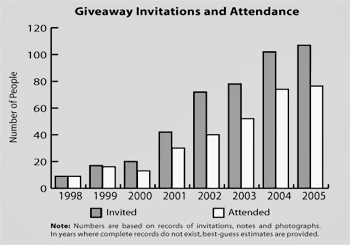 The Giveaway continues to grow and change with the times, and meetings are held before and after each Giveaway to determine what's working and what's not. The Giveaway is an evolving project which continues to get better each year. As with all Jeffco projects, we listen to everyone's opinions and try to make our projects better each time out. If you have any comments or suggestions on the Jeffco Invitational Giveaway, .